Moses in his Mother’s arms was painted by the British artist Simeon Solomon (1840–1905). 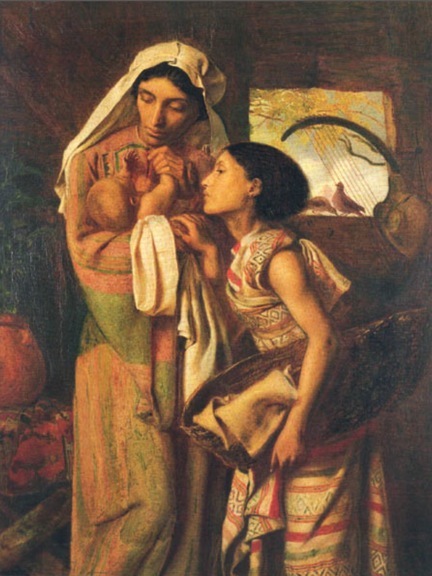 In a study of the many woman of Exodus, the first women we encounter are the midwives Puah and Shiprah. In an attempt to control the Hebrew population of slaves, the king of Egypt commanded the midwives to kill all the Hebrew boys as they were born. The midwives make up a story about how quickly Hebrew women give birth and thereby thwart Pharaoh’s plan. If it weren’t for their defiance, Moses would not have lived. Then Pharaoh commanded all Egyptians to throw the male Hebrew babies into the Nile. If Moses’ mother Jochebed had not defied the royal edict and constructed a waterproof basket and released him into the river, Moses would not have lived. If Miriam had not facilitated the retrieval of her brother from the water, and if Pharaoh’s daughter had not adopted the baby as her own, Moses probably would not have lived. If any of these links in the chain of action had failed, then the chances of genocide would have been very high, or at the very least the Hebrew people would have faded into history. “God came in an unexpected way, using a diverse collection of women who came together to fulfill God’s liberation plan. This intergenerational, interfaith, interracial group of women came together, creating the ‘Moses event. '” (Gill, p.20) This pattern of “if it hadn’t been for this one thing then all would be lost” is a reoccurring theme throughout the Bible. Curiously women tend to be actively involved at these critical moments. Among all these women, it is Moses’ mother Jochebed I want to focus on. She literally saved the Hebrew people by building an ark, covering it in bitumen and pitch just as Noah did with his bigger vessel. Jochebed even echoed God’s words at creation: “she saw how good he was.” Aside from the difficulty of obtaining the materials while under the watchful eyes of the Egyptians, how might she have come up with her plan? Perhaps she was inspired by the Egyptian myth of Isis who placed her infant son Horus adrift on the Nile. It seems very likely that she did some reconnaissance to determine the bathing habits of the Egyptian princess. In addition she must have had some inside information about the Pharaoh’s daughter’s desire for a child, her compassion, and her rebellious spirit. During the rabbinical period, Jochebed was highly praised and credited with a number of other heroic and righteous acts. I recommend Barbara L. Thaw Ronson’s book, The Women of the Torah for a summary of these additional stories. Some commentators argue that this pocket of resistance on behalf of just one male child is a demonstration of the andocentric nature of the text. If it had been Miriam in the ark, and everyone had worked for her salvation, would that make this story egalitarian? Assuming Miriam took up the staff and went before Pharaoh and saved the Hebrew nation, would all the women who assisted her have been less powerful or essential? I think that Puah, Shiprah, Jochebed, Miriam and Pharaoh’s daughter were exceedingly brave and ingenious women regardless of the gender of the child they saved. Though Moses and his actions get more airtime, that doesn’t necessarily mean that he was the only prominent leader. There is a great deal of scholarship that analyzes Miriam’s role as a prophet and what female leadership traditions might have been suppressed. Imagine what we might be missing. Imagine what the Bible would be without the women of Exodus. Thanks for citing me. It’s always nice to be recognized.